The Gathering opened up today. A gacha event that seems to only happen yearly so it isn’t like it’s going to show up again anytime soon. There’s some great stuff there too and yours truly has a set for you that I think is pretty cool. Uniquely designed chairs where the tree is the actual chair. Bent and molded to create a living piece the Serenity Tree chairs come in a few different variations. The rares are the big ones. Two different chairs, one white bark and sweet cherry blossoms. This one has windchimes and floating flower petals to add to the mystique and beauty of the piece. Each chair has couples and singles sits so you can snuggle up beneath the foliage with a loved on. Also each has a drape that comes in 6 different colors, so you can decide which one you would like to use. The second rare is the Seasons tree. This one has a darker bark and oak leaves. 7 different leaf variations so you can have everything from an autumn look to the deep green of summer. Beautiful to look at and very calming. 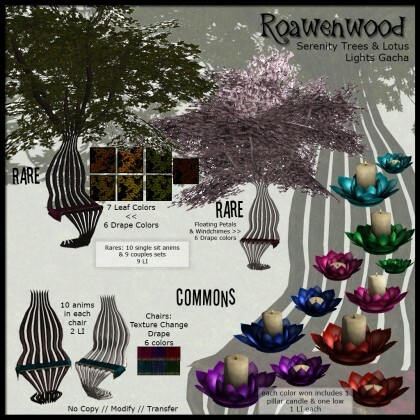 The commons for the gacha are some plainer chairs without the tree tops foliage but still has the different colored drapes and to round out the set are some very pretty rich and vibrant lotus flower candles. There’s two sizes of candle, a pillar candle and then a short one. When you win this you get both sizes of candle so you get 2 instead of just one. They just pop with color and are so pretty. I was throwing them around my place all over. 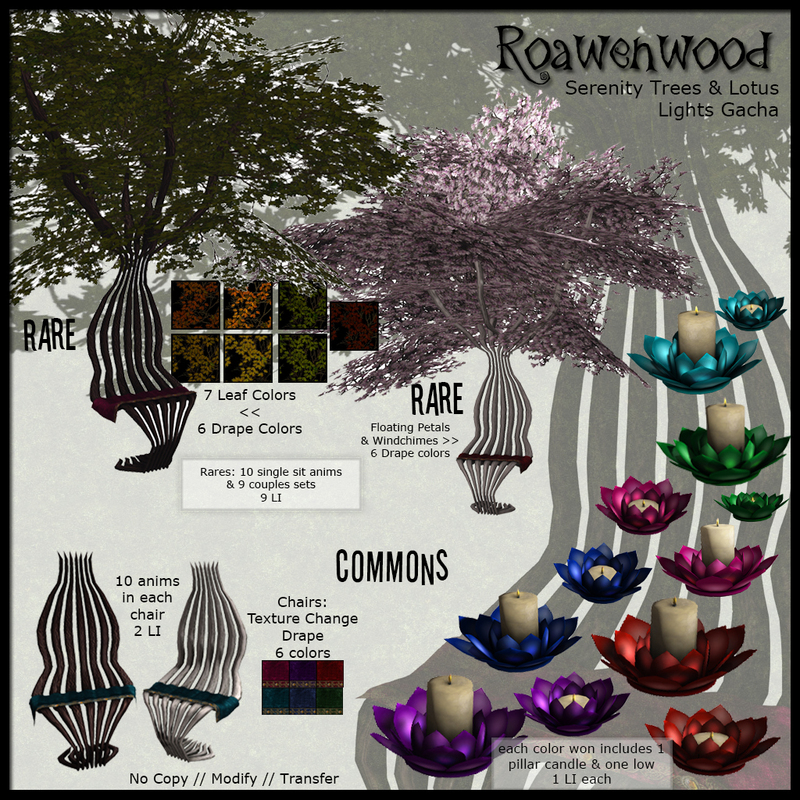 LI is decent, the rares are 9 LI, the chairs are 2 LI and the lotus candles are all 1 LI each, if you link them then it goes down. They’re all available now at the Gathering Gacha event! Posted in: Fantasy, Furniture, Gacha! ← The Secret Affair — Vikings!